My phone spends about two thirds of the day on silent or vibrate mode due to classes, meetings, or other events where it may be inappropriate to have a ringtone going off, so when I heard about ViBe, my interest was already piqued. 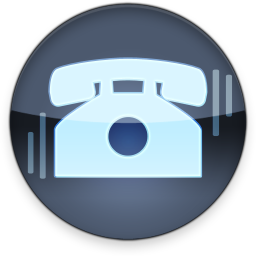 The problem – until now – with keeping your phone in vibrate mode, is that there is no way to know who exactly is calling or texting without indiscreetly peeking at your screen, which can be almost as distracting as if you had the ringer turned on. 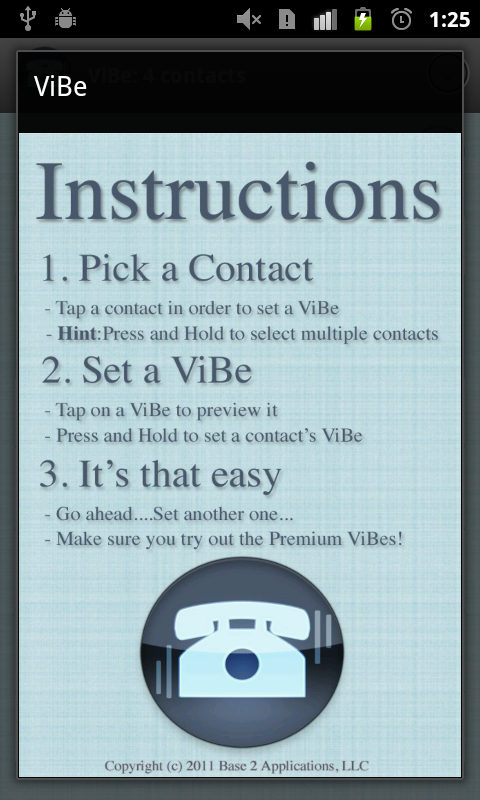 All of that changes today, however, with Base2Apps' introduction of ViBe, an awesome new app that allows the user to set custom vibration patterns for individual contacts. I was lucky enough to get some experience with the app before its official release, so I've prepared a brief hands-on to show you how it works. One of the brilliant things about ViBe is that it's simple. The app's interface and functionality are extremely intuitive – the screen that appears every time you open the app tells you everything you need to know to get started. 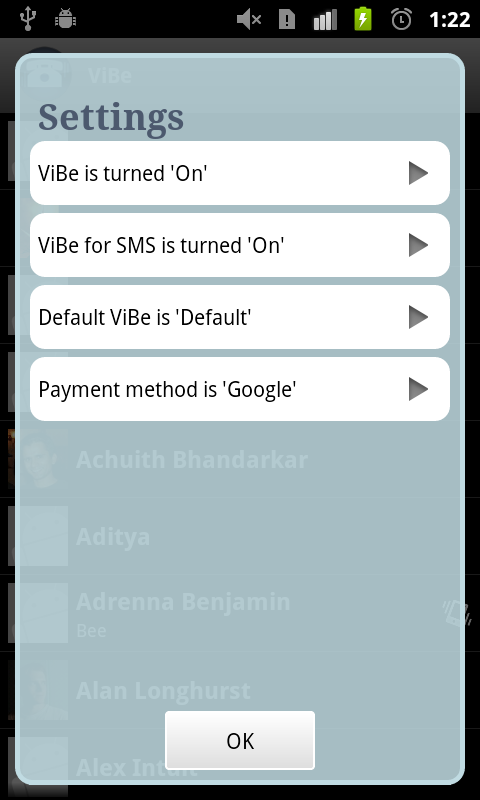 After the instruction screen, ViBe takes you straight to your contacts list, where you can select multiple people to set a single ViBe for, or just choose one at a time. The next screen is where things get interesting -- you can preview each ViBe pattern, before long-pressing to set it for the selected contact(s). 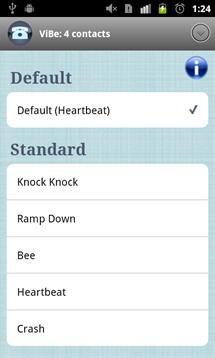 From this screen, the user can also purchase "premium" ViBe patterns for $0.99 each (or at a discounted rate if bought in a bundle), using either PayPal or Android's billing system. It's worth mentioning that ViBe allows users to not only set custom vibration patterns for calls, but that it allows for custom SMS patterns as well, making it easy to know who's texting you without looking. Moreover, you can disable ViBe SMS and call vibrations independently, giving you a great amount of control over how (and when) the app functions. 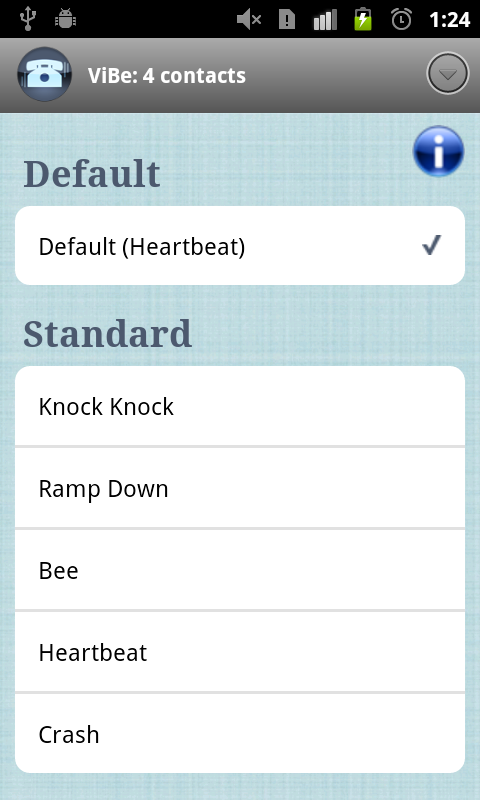 Overall, the idea behind ViBe is genius, and I think Base2Apps' implementation of the features is brilliant. It's easy, functional, and practical. If I had to change one thing about the app, I would expand the list of "Standard" ViBes, but considering that the app is brand new, and totally free of charge, I'm pretty happy with the selection already available. If you find yourself keeping your phone's ringer turned off for most of the day, ViBe is a great option. Considering the fact that it's free in the Android Market, I would definitely recommend trying it out.